I know what you’re thinking. I was thinking the same thing too as I ate three of these. It went straight to my hips. From mouth to hips. Immediately. It may have something to do with the fact that not only did I eat 3 of these, but I have also eaten 3 of all the flavors I fried up. Plus the additional 1/2 lb bacon while it was cooling. I may have licked the spoon too after frosting these. Maybe. My friend Amy told me about this flavor combo, and I’m so glad she did. It tastes like pancakes and bacon with syrup. This will be happening again soon at our house. It was sooooo good. Hope you enjoyed doughnut week, see you all on the other side of the weekend! 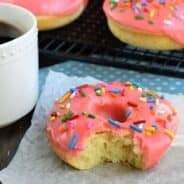 Prepare doughnuts according to basic yeast donut recipe (see recipe index). For the topping, in mixer, blend milk with maple syrup. Add in maple flavoring. Beat in powdered sugar until smooth and desired consistency. Dip each doughnut into the maple frosting and then sprinkle with bacon crumbles. For extra maple flavoring, use a maple bacon variety. Enjoy! Drooled right on my keyboard. Man these look good. Mandy threw up in her mouth because she hates maple syrup. I however am asking you to make these for when we come for Christmas. Wow… bacon on a doughnut? Something I would love to try! Bacon and doughnuts together? It seems so right. I’ll have to try these. I think I”m going to make these for a bacon lover’s birhtday treat! Doughnuts have never looked so good. We are maple addicts here and how can you go wrong with bacon? Perfect! 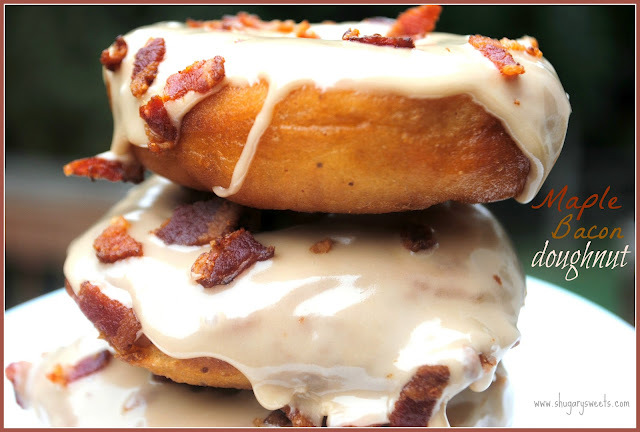 Maple, Bacon, and Doughnut all in one, this is awesome. A really great treat, that I can’t wait to have. Hope you have a great week end and thanks for sharing with Full Plate Thursday! These look insane and oh how I want one! I’m not going to be able to get these out of my mind….ever! We’re totally into the whole maple bacon thing right now. But on donuts??? I’m so there! They look wonderful!!!! O.M.G. I’ve never had a bacon maple donut even though they’re becoming so popular, but I need to hop on that bandwagon and fast. These look awesome! 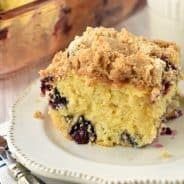 I’m so gonna have to try a baked version of these! 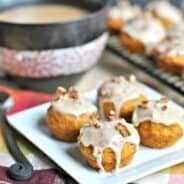 I found these after I spotted your maple bacon cookies on Pinterest..I will definitely be giving those a try ASAP! Baked sounds delicious! I may have to try that too! !